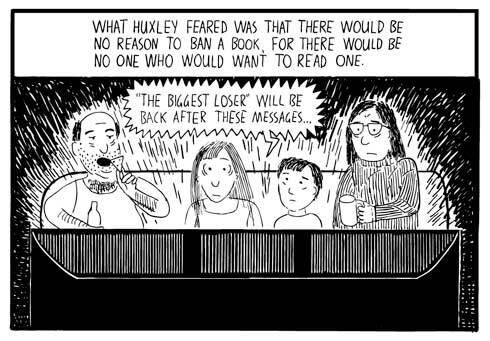 Huxley vs. Orwell: Whose Vision of the Future Are We Living In? Aldous Huxley is one of the few writers whose entire published output I’ve read. (Others include A.J. Liebling, Dorothy Parker, Raymond Chandler & Dashiell Hammett). I’ve also read a good deal, though not all of, the work of Eric Blair (George Orwell). 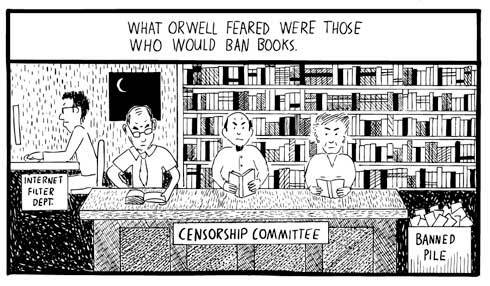 Between them Orwell and Huxley wrote the two classic dystopian novels of the last century, 1984 and Brave New World. As much as I admire Orwell, I believe that Huxley came much closer to being prescient as this cartoon piece, “Amusing Ourselves to Death” by Stuart McMillen shows. This is Neil Postman’s argument (from his book of the same name) given graphic form.